Brothers Ed, Fred and Eric Mills co-founded Global Harvest Foods, which started with late-night mixing and bagging in a basement and grew to be one of the biggest birdseed manufacturers in the country. Like most kids with parents in the military, the Mills brothers spent most of their childhood moving around from place to place, each with a new school, new landscape and new faces. Bird-watching provided a rare constant for the brothers, Fred, Eric and Ed. They picked up the hobby from their mother, and it provided an easy activity that could be done anywhere they moved around the U.S. Quantity: Ships more than 500 million pounds of bird food a year. Source: Majority of the ingredients are grown in the U.S. on family-owned farms. Nearly 3,000 acres of sunflower are grown for the company in Washington alone. Contents: The company’s feeds use nearly 100 different ingredients. Facilities: Six plants, one in Mead (near Spokane). Others in Colorado, Pennsylvania, South Dakota (two) and Indiana. Their love for birds has turned into a business. For 35 years, the brothers have owned Global Harvest Foods, headquartered in Seattle. 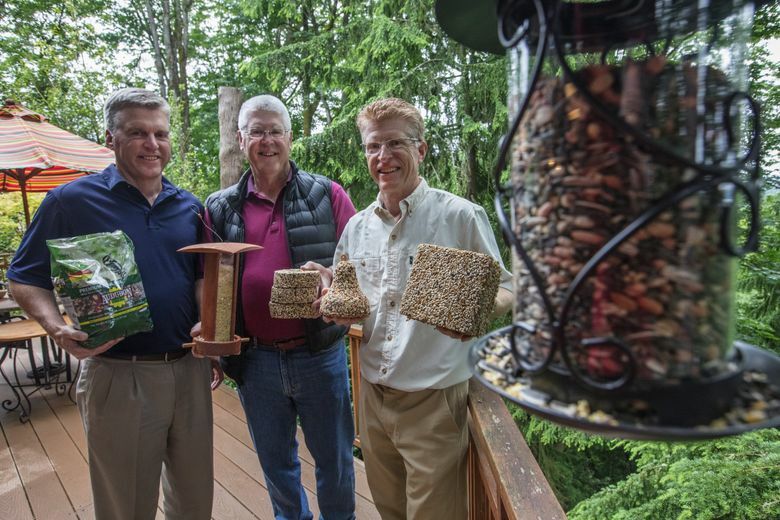 The company has grown to become one of the largest birdseed manufacturers in the country, and employs more than 250 at six manufacturing plants from Washington to Pennsylvania. Global Harvest manufactures over 600 different types of products, found on shelves nationwide under the names Global Harvest Foods, Audubon Park, Songbird Selections, Morning Song, Wild Bird Centers of America and Audubon Friends. Besides its own brands, the company is also the largest private-label manufacturer for dozens of others. Despite their love for birds, their journey to become one of the biggest bird-feed manufacturers was not their original plan. The brothers, now ages 57 to 61, began their careers in commodities trading, starting with Fred, the oldest. Their trades included sunflower seeds and milo seed, which were sent to China and mixed into birdseed — this sparked the idea of mixing bird feed domestically themselves. That involved a lot of experimentation and trial and error. In their basement, the brothers mixed together different seeds to try to find the right mix — not an easy task when all birds have different preferences. During the day they continued to trade commodities, and at night they would run a mixing machine and bag bird feed. Eric said his girlfriend (now his wife) joined in to fill bags into the night for orders the next day. “With help I could fill 11 an hour, without help only six or seven,” Eric said. One of their first customers was the Haggen grocery chain. Ed said that Don Haggen, who led the company at the time, was a big birder. “If we could satisfy him, we could satisfy anyone,” Eric added. The brothers kept pushing and growing the business, starting with a Northwest regional focus at retail chains such as Ernst, Pay ’n Pak, Haggen, Fred Meyer, Costco and Bartell Drugs. Acquisitions by their customers meant quick expansion to meet demand, and the company’s reach began to span the country. Global Harvest itself also grew by acquisition, buying Wild Bird Centers of America in 2016, Scott’s Miracle-Gro Wild Bird Food in 2014 and Audubon Park and Audubon Friends in 2006. The company declined to disclose its revenues. From the beginning, the brothers said, they have focused on quality. Global Harvest was one of the first wild birdseed companies to have its products safety certified by the Food and Drug Administration. The products include bags of birdseed blends, large cake blocks filled with seeds or dried mealworms, suet cakes designed for small basket feeders, and ready-to-hang bell-shaped blends. 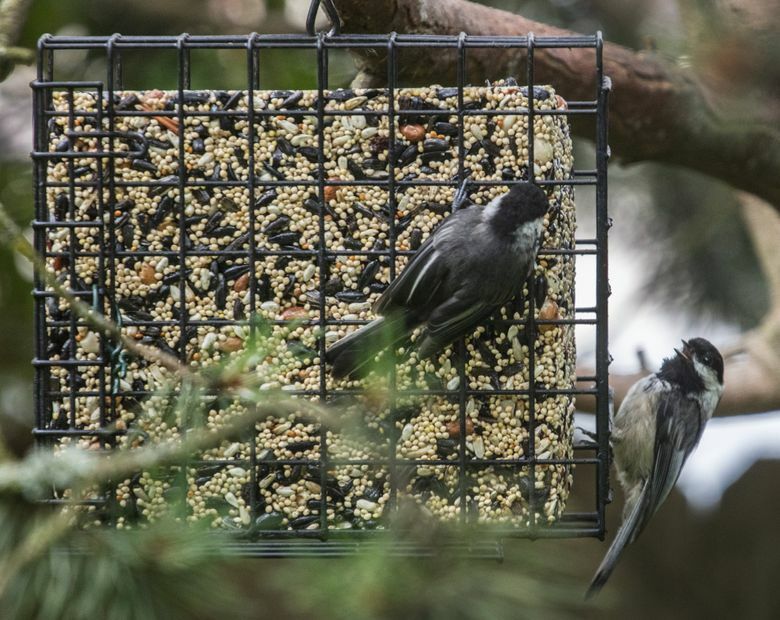 Developing a bird feed is no easy task, the brothers say. Each species has its own preference, and each product has to be carefully developed to suit different regions and their local birds or other critters. Each product is labeled for what animal it attracts. Mealworm seedcake, for example, is designed to attract bluebirds, orioles, wrens, jays, chickadees and titmice. The company also makes products that can be used strategically to distract other creatures that might be looking to steal bird feed. “Critter Crunch,” which contains peanuts, corn and sunflower, attracts animals like squirrels and chipmunks, and is designed to be a more attractive option that makes them leave the bird food alone. “It’s way more complicated than you would imagine,” Ed said. Another challenge is unexpected shifts in supply or regional politics, which can affect pricing and production. For instance, sunflower, a common ingredient, saw a poor harvest season in 2011, leading to shortages and increases in pricing. Their different brands provide options for a range of price levels, from the more premium Songbird Selectionsto the value brands Audubon Friends and Country Pride. The company’s ability to encourage an interest in nature is something the brothers find exciting, and they look to their customers just as much as they do the birds. “One area that we’re proud of is aiding in the relationship between humans and birds,” Fred said. The brothers maintain that birds don’t just learn areas with bird feed, they also become familiar with the people that feed them, and sometimes they become less timid. Eric recalled that he was trying to take a picture of a bird the other day when it flew right up to his phone and perched on top. “It’s amazing how bold they can be,” Eric said. Feeding wild birds can help maintain populations, especially in areas where residential development has eliminated or reduced natural habitats. The Census Bureau’s 2011 National Survey of Fishing, Hunting and Wildlife-Associated Recreation found more than 46 million Americans count themselves as bird-watchers, and they spent about $4 billion on bird feed that year. The brothers also see benefits for humans. The activity is a good excuse to put cellphones and other electronics down, and experience nature unplugged. “We want to make sure the next generation appreciates nature and wildlife as much as we have, whether they feed birds or not,” Ed said. “We try to convince the kids it’s more fun than video games,” Fred joked.